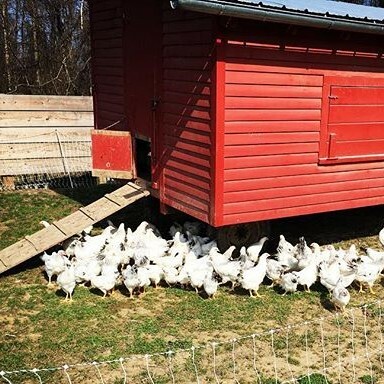 Yellow Bell Farm's principal farmer, Katie Bogdanffy, grew up on New York poultry farm, and now she's the third generation to earn her livelihood by raising chickens. As her mother, Nancy Austin, says, "it's in her genes." On a recent frigid February day, we called up Katie and asked her, "What's it like to be a chicken in the winter?" With a laugh, she responded, "They are more comfortable than we are these days!" She was referring to her flock of Cornish Cross chickens, nestled warm and toasty inside their coop. In the name of comfort, Katie has a point of comparison: every morning at 5am, all year around, she begins the day by checking on her birds. During winter's dark mornings, all through to the bright glory of summer, she's there. Katie completes every step of her chickens' care by hand. There are no mechanics in the process, even in the inevitable, final step. In the mornings, she draws them fresh water and replenishes their feed, a custom seed blend, milled on the farm, without any chemical additives. Her daily ritual ensures a happy and healthy flock, free of antibiotics. She repeats the process every night. "I love producing a healthy, quality product," says Bogdanffy, "and the best part is getting the great feedback at the farmers market." After honing her skills with her family, in 2014, Katie began building her own nest under the name of Yellow Bell Farm. She wanted a bright, cheery name for her new venture, and she chose Yellow Bell as the nickname for her favorite flower -- buttercup flowers. Looking to the future, she'll continue with fresh chicken meat and eggs, and plans for a line of more diversified chicken products, too.